Melt the butter in the frying pan and toss in the beef bacons. Fry the bacon until crisp. To drain excess fat, transfer the fried bacon on absorbent kitchen paper. Pour the beans into the pan and warm them slowly. When it is hot, put back in the sautéed bacon and stir well. After a minute or two, stop the cooking. Pour the beans into some narrow bowls and sprinkle some chopped parsley before serving. 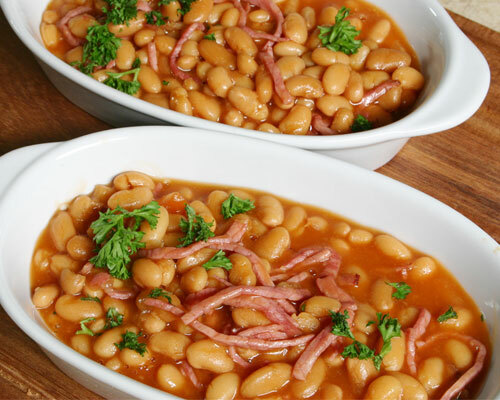 Comments: This hearty dish made with the combination of baked beans & bacon is packed with energy yielding nutrients Vitamin B1 & B12 which also prevents anemia. Not only they are chock-full of protein and fibre but also provide important vitamins and minerals, including iron, folic acid, zinc and selenium. The fiber derived from baked beans not only prevents constipation but also helps to eliminate cholesterol from the body. The saturated fat content of about 40% of our daily value comes from beef bacon and butter added in the recipe & this can be substituted with reduced fat bacon/low fat butter.